Over my 16 years as an educator I’ve learned one valuable lesson: Never underestimate the power of a cute baby animal. This has proved true for working with angry five year olds who have difficulty regulating their emotions (somehow looking at pictures of baby animals can sometimes immediately cause a child to relax). So a few years ago when I saw a Ready to Read pack of Zoo Born books I immediately grabbed it because I figured at some point there would be a student who would want to read them, or just look at the pictures. Lately, when I’ve been preparing Joey’s book crates I’ve been including a Zoo Born book or two into the box to add variety to our work. I quickly found that Joey really enjoys looking at cute baby zoo animals as much as all the other five year olds out there. Who wouldn’t? For Joey, these have been perfect. They allow us to look through and talk about the pictures with his AAC device. What does he see? Is the animal cute? Small? Silly? Furry? Soft? Many of the animals are in his vocabulary, so I can turn the page and he can tell me what he sees and describe it for me. Then, I can read the left hand page and pause so he can use his early reading skills to read the right hand page. I model putting together at least part of the sentence on his device the first time so he knows what I expect him to do, and has a reminder of where the words are. The next time I come to a repeated phrase, I pause and say, “You read!” He doesn’t have all the words to complete the full phrases, but he is able to put together at least part of it. “Love you Panda!” “Good night Owl”. For our newest five year old readers we want them to begin to understand that print goes from left to right, the words contain a message, and words maintaining their meaning across each page – the group of letters – LOVE – says love on each page. These are the early reading concepts pre-kindergarteners are exploring right now, and Joey seems to be ready for this work as well. The Zoo Born series allows us to enjoy talking about books and cute animals, practice his core words, and build on his early literacy skills. And who doesn’t want to gaze at pictures of sleeping panda babies? Somewhat related – I was listening to the podcast Wow in the World with my own kids and learned about the universal reaction to looking at cute animals. See, it’s a thing! When I first picked up the book it seemed simple and silly – both of which are a plus. Simple books tend to give us more opportunities to encourage interaction from Joey, instead of simply having him listen as I read. I laminated a picture of a tree and covered it in velcro dots. Then I found clip art of the items the boy threw into the tree and made velcro cards so that Joey could find each item and place it into the tree – watching as the tree goes from having one item to being ridiculously full. To support Joey’s counting in a sequential order I also added a numbered list so that the velcroed items could begin on the numbed list and Joey could carefully take off each picture in sequential order and add it to the tree. Because of the character’s repetitive actions of throwing the item into the tree, It is an easy book to incorporate core words into. Joey can easily talk about what is happening in the story by labeling the items being added into the tree, or using prepositions to describe where the items are – in, up, on. The first time I read the book with Joey he paused halfway through and said “100.” Yes – it feels like there are 100 items going into the tree. I love that Joey’s words give him the opportunity to show that five year old number sense – anything that is “a lot” is obviously 100 – not accurate, but it captures the assumption going on in their five year old brains. Admittedly , Joey seemed to lose interest in this book after awhile. It was a fun initial book, but didn’t give us the sustaining power that Room on the Broom, or Not a Box has. Now I’m off to find more engaging books. One of my favorite new children’s books is Not a Box. Throughout the book, a voice (one assumes it is an adult) asks a rabbit “Why are you in that box?” next to a picture of the rabbit on, in, next to, etc a box. When you turn the page the rabbit replies, “It’s not a box.” This time the picture shows the rabbit imagining the box is a race car, a mountain, an elephant, etc. It sums up my own childhood perfect – no cardboard box was ever just a box. It was whatever my imagination could make it become. Typically I read it with children before handing them an empty box and setting them free to create and pretend. Originally, my plan for Joey was different than that. 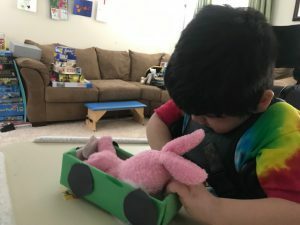 I thought he would like the rabbit’s imagination, and it would give many opportunities for Joey to practice core words, along with some of his favorite nouns (like car and fire engine). And it was perfect for this. It allowed me to model using the “not” button for Joey, which he does not use often. We worked on prepositions as the adult voice asked why the rabbit was in, on, next to the box, and Joey had the opportunity to predict what the rabbit would do next. It was a simple, fun read aloud with lots of engagement. After awhile I started to feel bad. It’s hard to read a book about an imaginative rabbit and not give Joey a chance to imagine too. I’d brought empty boxes to play with, but typically I let kids decorate the boxes and get crafty. I hadn’t done that yet with Joey. So the next time I came back I brought my arts and crafts box, determined to let Joey make something from the box. This in itself provided us opportunities for natural, back and forth language. What color paper should we use? What shape should the wheels be? What color should they be? So we did. We used the small iphone box, covered it in green construction paper and added black wheels. (Once we started taping them onto the box we decided to stop at 4). We got to play car. Joey even made the engine noises as we pretended to roll the car around on his tray. And every time the car fell off his tray? It honestly was one of the most fun and playful sessions I’ve ever had with Joey, who usually wants to work or read. And one of the times that he showed such natural five year old imaginative play skills. Toward the end Joey said “Make helicopter”. 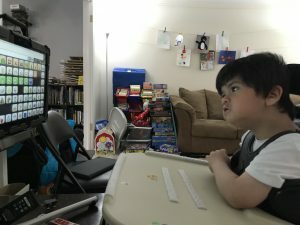 Sometimes when I am working with Joey it is easy to forget that there are other aspects of communicating with an AAC device that we don’t naturally think about. 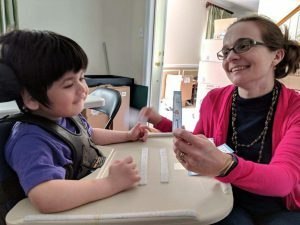 The device gives Joey access to words, which makes it easy to focus on the words themselves. After all, words are how we communicate. 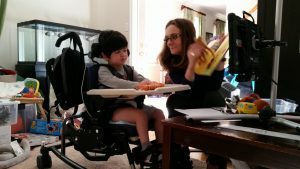 Yet one aspect of using the AAC device fluidly for Joey includes the clear button. Hitting this button erases the words from the top of the screen so that Joey can start a new sentence, new idea, or thought. Although those of us modeling for Joey use it fluidly and without even thinking that we are clearing the screen. It took me a bit to realize I needed to actually teach Joey how to use the clear button, when to use it, and then to prompt him to do so. I have to catch myself from hitting the button when I’m ready for Joey to start a new activity or share a new idea. Clearing out Joey’s words – even if they are nonsense to me – is like ignoring someone’s request or telling them not to share their ideas. Because Joey often takes multiple attempts to hit the correct word, it can appear that he is sharing a string of random words when in fact he is carefully placing together a message he wants to tell me. It feels random and off task, and I have a sudden internal need to clear the screen to get back to work, but I have to stop myself and remember that Joey has a message hidden here. Instead of clearing his words, lately I’ve been trying to ask him to do it for me. I’ve been surprisingly pleased at how well Joey has responded to this. He has happily cleared the words on most occasions – and on the times he hasn’t it has been because he has a message he wants to share with me. I’ve also been pleased at how much Joey is now using the clear button automatically, without being prompted to do so. He is beginning to internalize those “I think you have a new idea now” prompts, and is doing it himself. It makes it easier to understand his ideas, and follow his thoughts. 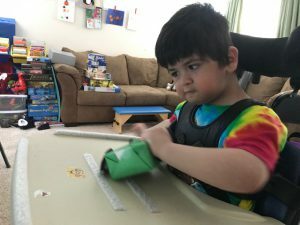 Last week I wrote about discovering that Joey had difficulty counting small sets of objects or pictures. Although he can sequence numbers and identify numerals, he seemed to be getting hung up on the act of counting. I was stumped for a bit. 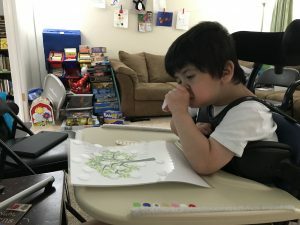 Joey’s unique profile makes it difficult for him to touch items in order to count them, and it is unclear what he actually sees in his visual field. We have no idea if he is seeing double, or if he has difficulty tracking items in front of him. How do you learn to count when you may count the same item repeatedly because you can’t see the items clearly? In my DIR/Floortime coursework with the International Council for Developmental Learning, I frequently hear the phrase “go slow to go fast” or “go slow to go up”. I decided this is exactly what Joey needed with counting. 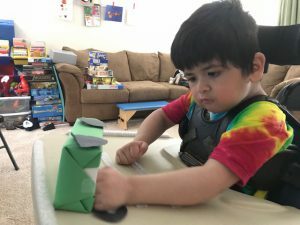 I knew he was capable of the concept, but I was not sure he truly understood the concept because of his physical limitations. Something in his basic number sense seemed to be off. So we counted small sets of items. Joey would get mad and frustrated with me, and I’d try to make it fun, but also to keep pushing. I knew Joey could count. Slow and steady. Slow and steady. Modeling counting sets of items. Guiding his hand to touch each item. Giving him an opportunity to count in his head while I pointed to the items. Then giving him a chance to count by himself. Slow. Steady. Numbers 1-5. At one point during this work Joey went from frustration to laughter. True Joey laughter. The kind he makes when he tells a math joke. It was as though suddenly he understood counting. After he began to laugh he was correct in counting amounts every. single. time. I took fire engines away and had him count the new amount. I added fire engines. I added a bus and asked him to count the total amount. He giggled, laughed, and tilted his head back with giggles. Then he reached for one of the number card choices I was holding and grabbed it from my hand. Yup. He was right. Five vehicles now. Was he playing me all this time and just now decided to let me in on the joke? I wouldn’t necessarily put it past him… but at the same time, it didn’t feel like that in the moment. It felt like I was asking him to do something he didn’t understand. He’s not used to getting answers incorrect when he works with me, and what I saw over the last month, after I discovered he was having difficulty counting, was true frustration. Today, after all that practice, slowly counting sets of objects and matching them to the numerals he knew so well – today did it just click? Was it the noises I made? The silliness of the game of adding fire trucks to his tray? I’m not sure we’ll ever know. What I do know is that Joey laughed his head off today while counting, and was able to count despite his laughter. The laughter of a kid who never gives up.